Sure, we managed to beat Empoli when they came to the San Siro at the beginning of the season. Somehow. It wasn’t pretty. So technically, we could do the double. But it’s not as easy as that. This will be a crucial match for both clubs, who are one point and two positions away on the table. And Empoli will have the home advantage, too. One might think Milan would have an advantage after playing the game of the season on Sunday, but that’s just it… Milan have struggled to string together even back to back performances all season. So if you think this will be an easy win, you may want to do a double take. Empoli’s current form is W-W-L-W-D, with that loss being to Inter. With their talisman and ex-Milan castaway Saponara out sick with the flu last week, they drew to Chievo. For that match, Giampaolo lined up Skorupski; Zambelli, Barba, Rui, Tonelli; Maccarone, Croce, Zielinski, Paredes, Krunic; and Pucciarelli. Paredes got a yellow in that match which will see him suspended for our match for card accumulation. Additionally, Costa is questionable due to fitness. But Saponara is expected to play, of course. Will he hurt us again? 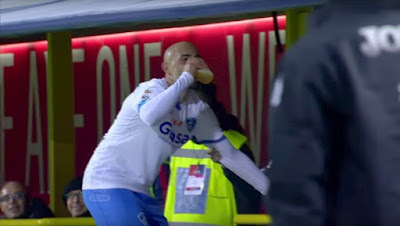 Or will it be Maccarone, with his beer chugging celebration of the season? I’m not sure I am as concerned about the score or the outcome as much as I am concerned about Milan maintaining the same level of performance or even similar. Of course, if we play that well, the result is almost undoubtedly going to come. And it’s hard to imagine Milan caving with everyone feeling so good and smiling and not having a midweek game to play this week. Actually, no. No, it’s not hard to imagine Milan caving, we’ve seen it so many times, it’s almost like a script. The injuries are almost like a script as well. Mihajlovic will be without Ely, Lopez, and Menez, with Mexes a possibility to be called up depending on fitness. Balotelli played a few minutes on Sunday, as did Boateng, so in addition to playing a great game, we have a couple of Galliani’s infamous “new signings.” Which is great, because with so many rumors about players leaving to make room for actual new signings, as of this writing, no one has actually left except Suso at the beginning of the mercato. 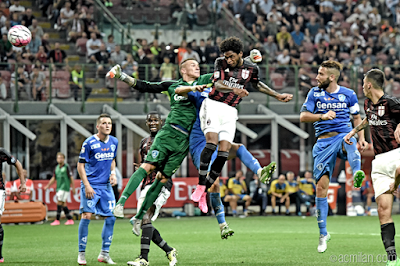 This one has all the potential of a classic Milan heartbreak from recent years, particularly the beloved Saponara. But it also has the potential to be a great game, and possibly even another three points to keep us in the top six for another week. Since we beat Empoli last time but played just awfully, wouldn’t it be nice to get the win again, but show how far we’ve come this season in terms of performances? That would be one perfect double take.